From time immemorial, societies have sought to establish a lasting presence on this planet that would remind latecomers of their glory long after they themselves have abandoned ship and turned to dust. It doesn’t always work out the way we plan, however. 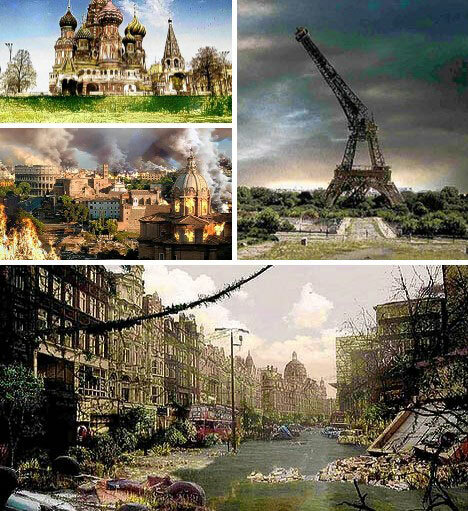 These sobering examples of post-apocalyptic art remind the living that what remains are more often ruins of abandoned places, towns and cities. 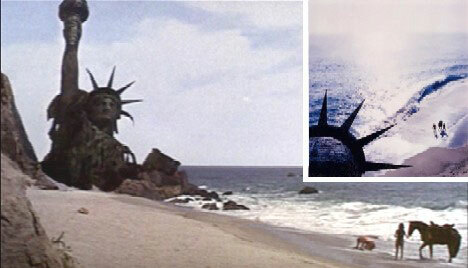 1968’s Planet of the Apes, the first in a flood of post-apocalyptic sci-fi films, is remembered for Charlton Heston’s defiant “Keep your hands off me you damn dirty ape!” and the iconic final scene featuring the Statue of Liberty, buried up to her neck in sand. 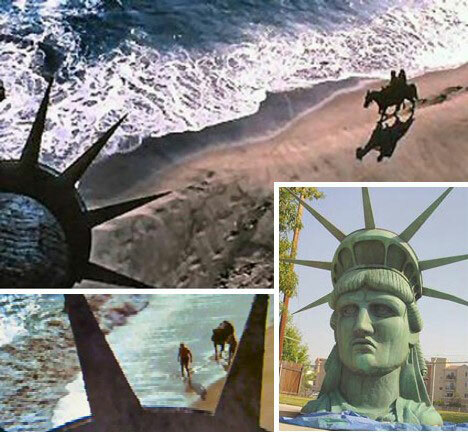 A 15-ft high plywood & styrofoam sculpture of the statue was offered at auction twice in 2007 but found no bidders at first $30,000, then $15,000 due to lingering questions about its authenticity as an original Planet of the Apes film prop. 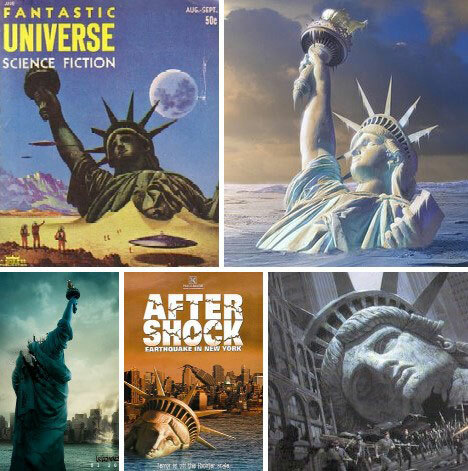 Gerry Canavan has posted a lengthy list of futuristic Statue of Liberty images taken from comics, films and more, most of which show an unhappy future for the iconic statue. 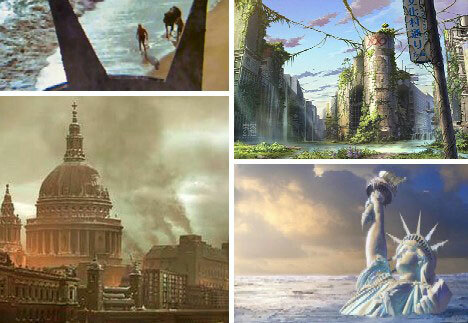 Clockwise from above left: Fantastic Universe (1953), The World Without Us (2007), Escape from New York (1981), Aftershock: Earthquake in New York (1999) and Cloverfield (2007). 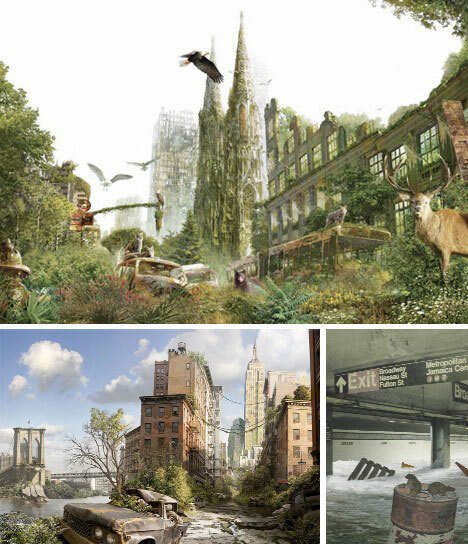 The rest of New York fares equally poorly in the aftermath of some civilization-ending event. The series of images above were created for Scientific American’s An Earth Without People. From the top clockwise, St. Patrick’s Cathedral, the New York subway and midtown Manhattan gracefully give way to nature’s inexorable forces. 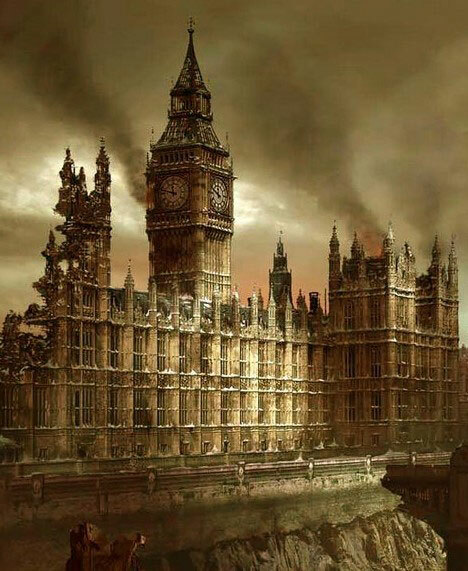 London, England as well has been the subject of post-apocalyptic artistry, most notably in the dark and disturbed wallpaper above. 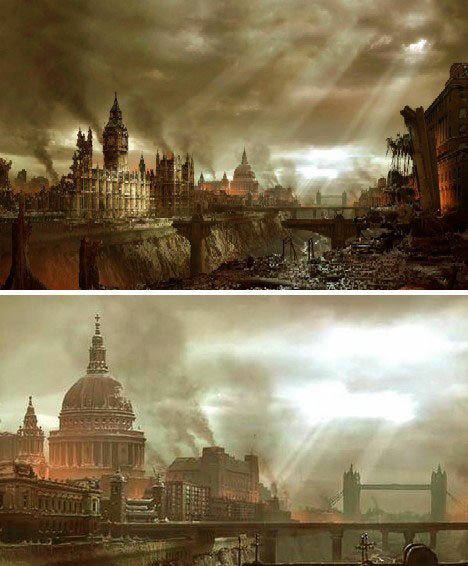 In this case, the apocalyptic event that devastated London looks to have been total war. Above is a close-up of the wallpaper focusing on parliament and Big Ben that shows the detail the artist’s vision of Great Britain’s greatest catastrophe. Above is another scene of London featuring Tower Bridge. 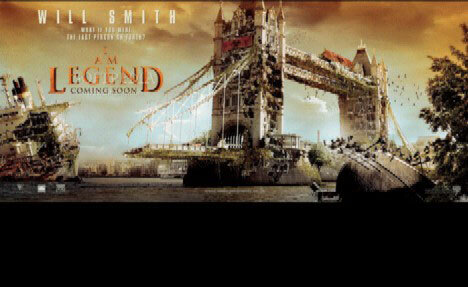 This is one of many post-apocalyptic cityscape screen-savers designed to advertise the 2007 film starring Will Smith, I Am Legend. 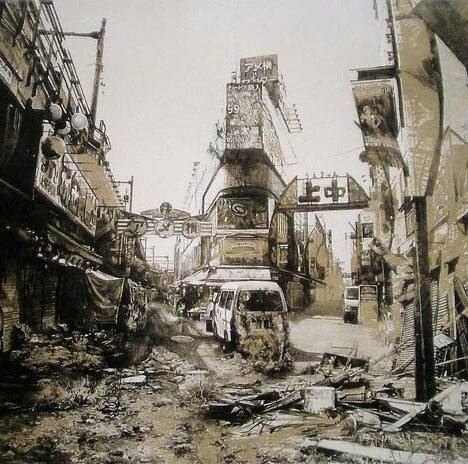 Movies like the Mad Max series and Death Race 2000 have delved deeply into post-apocalyptic themes but they don’t show much of urban life – or what remains of it. For that, we need today’s special effects and CGI, as showcased by 2004’s The Day After Tomorrow. 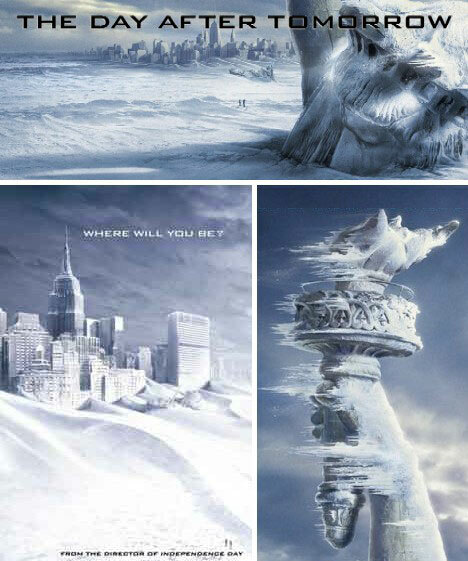 In the images above, Mother Nature deals New York a body blow before putting the Big Apple into the freezer. 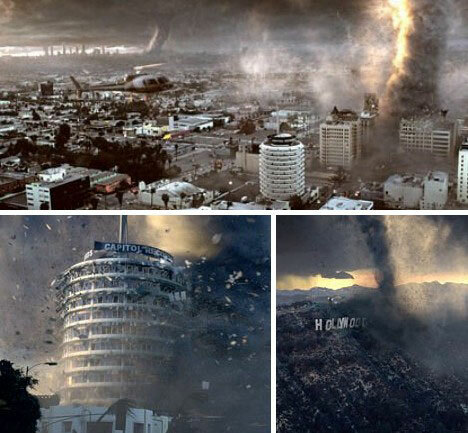 Los Angeles doesn’t get off any lighter in the The Day After Tomorrow, being swept by a tornado storm that makes mincemeat out of the Capitol records building and the world-famous Hollywood sign. Tokyo, Japan is arguably the world’s largest metropolitan area with more than 30 million people calling it home. What if they all suddenly vanished? 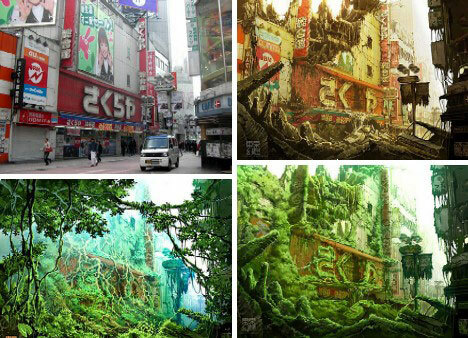 The above series of prints from Tokyo Genso shows (clockwise from above left) how downtown Tokyo’s bustling Shibuya neighborhood would slowly but surely revert back to nature over a period of months, years and centuries. Hisaharu Motoda has a different vision of Tokyo’s future that is much darker: will Tokyo go the way of two other Japanese cities who had doomsday visited upon them in 1945? 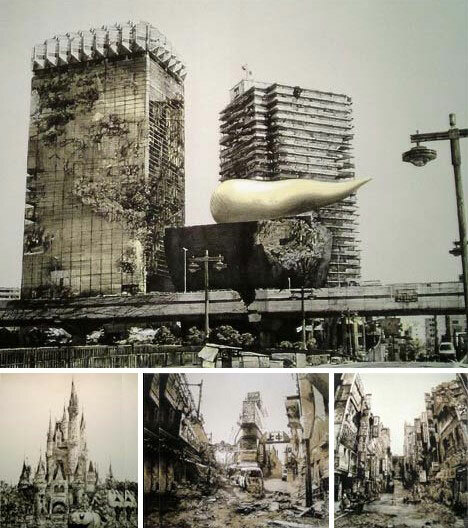 The above montage features the famous Asahi Breweries building with its golden “beer froth” rooftop sculpture, slowly decaying in the aftermath of some terminal disaster. Motoda’s grim sepia tones leave no question that in his imagination, the future is anything but bright. 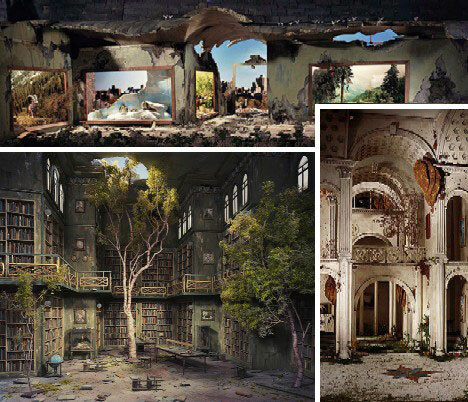 Lori Nix is an American artist whose “constructed photographs” resonate with forgotten grandeur and evoke a sense of something lost long ago – yet far ahead in time. What’s even more fascinating is that Nix’s meticulously detailed creations are miniatures. 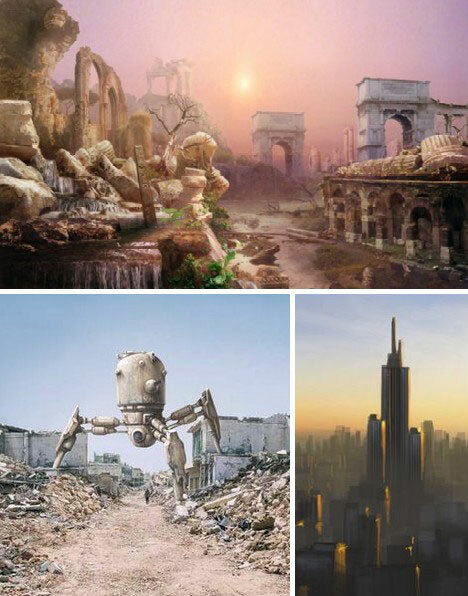 Post-apocalyptic imagery is popular among readers of science fiction and fantasy, and artists have achieved varying success in crystallizing speculations of what the future might bring. The above images bridge the gap between scientific extrapolation and free reign of the imagination when contemplating the shape of things to come. Structures built mainly of stone will far outlast metal and glass skyscrapers constructed with stressed-skin techniques. 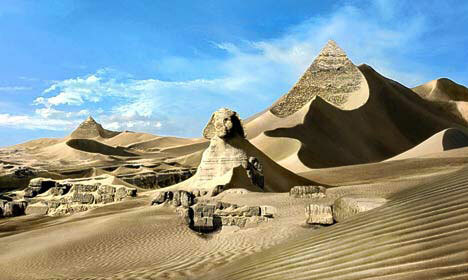 The above futuristic rendering of Egypt’s pyramids and sphinx, already thousands of years old, shows them little worse for wear but for steadily encroaching sand dunes. How will the world’s modern architectural marvels compare, one hundred centuries after we have gone?